No matter how many followers you have, it's easy to get caught up in sustaining the image you've cultivated of yourself and your lifestyle on social media. It's one thing to playfully admit that you #DoItForTheGram and have to maintain your #brand, but it's another altogether when you go to extreme lengths to capture a pic that reaffirms your online identity. That was unfortunately made all the more apparent last week, when a couple known for daredevil Instagram posts accidentally fell to their death off a cliff in Yosemite National Park while trying to take a selfie. 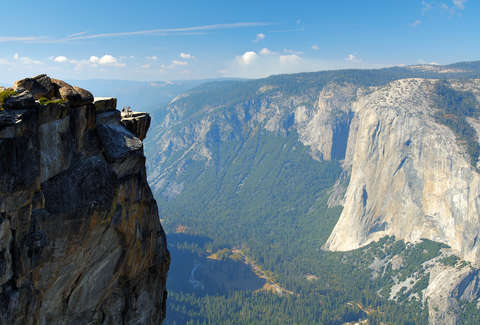 Last week, Meenakshi Moorthy and Vishnu Viswanath, who documented their travels on their popular Instagram account, plummeted 800 feet from Taft Point while attempting to get a photo of themselves. The Indian couple were reportedly last seen setting up their camera with a tripod on the cliff lookout, but the next day, visitors noticed a tripod still sitting on the ledge and alerted authorities. Their bodies were found after a specialized team reached them below. The tragic incident illustrates not only why it's not worth risking your life to snap a pic, but also that a national park like Yosemite is not an amusement park and should be navigated mindfully. It's unclear what exactly caused them to fall, though only part of the popular lookout point has a railing. When photos of the couple hit the news, one fellow hiker, Sean Matteson, recognized Moorthy in the background of a photo he'd taken, and explained they were alarmingly close to the edge. "She was very close to the edge, but it looked like she was enjoying herself," said Matteson, in an interview with NBC News. "She gave me the willies. There aren't any railings. I was not about to get that close to the edge. But she seemed comfortable. She didn't seem like she was in distress or anything."